Welcome to the general magic spells book. This book has everything that I couldn't fit into the other specialist books. 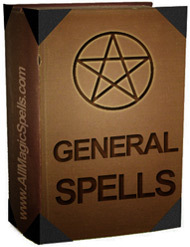 These spells cover a wide range of situations and needs. 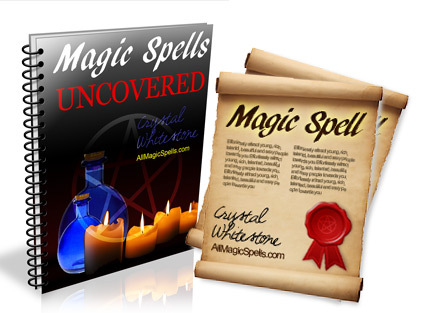 All the magic spells in this book are based on ancient and traditional secrets and knowledge that has been passed down to me by some very wise and powerful mentors, also techniques I have researched throughout my life as a witch, and also a few unique approaches to magic that I have developed myself after many years of practise and experimentation. The spells are very easy to do, don't require any items or equipment that are expensive or difficult to find, and can be done in a few minutes by anyone - young or old, beginner or advanced. They're also a lot of fun! We add new spells regularly, so check back often or sign up to the newsletter to receive email updates. If you want a specific spell but you can't see it below, click here to contact me and request it. Become A Vampire Spell - Vampires are incredible creatures. They are strong, fast, powerful and immortal, and have great mental and emotional capacity. Use this spell to become like a vampire. Pass Exam Or Test Spell - Got a big test or exam coming up? Don't panic, this strong magic spell will help you get the result you need. Beauty And Glamour Spell - Bring out your inner beauty with this powerful beauty spell. If you want to be a bit more glamourous and feel at your best every second of the day, this spell is for you. Confidence Spell - Are you shy in social situations, or afraid of putting yourself and your ideas forward at work? Do you find dating awkward? Improve your self confidence today with this spell. Improve Your Memory Spell - Forgetting something important can be the worst feeling in the world. Discover how to use magic to help you improve your memory with this spell. Sell Your House Spell - Are you struggling to sell your house? Do you want to move out a bad neighbourhood? Use this spell to help sell your house. Lie Detection Spell - Lie detection is a skill we all have built in to our genetic makeup, but for some people it's hard to activate that skill. Use this spell to heighten your powers of lie detection. Tell The Truth Spell - Fed up of people constantly lying to you? Need to find out the truth about something? Force people to tell the truth with this spell. Popularity Spell - Become a social butterfly with this spell that will create a positive and welcoming aura to attract good vibrations towards you, and make you the centre of fun social situations. Win Sports Event Spell - Cheer your team to magical success and victory with this sporty spell. House Cleansing Spell - This spell will purify and cleanse your house of negative energies or vibrations, evil spirits, and unhappy memories; leaving you with a calm, peaceful, harmonious and welcoming home. Good Weather Spell - Need to make sure the sun stays out for a big event you've got coming up? This is the spell for you.